The third annual Outstanding Women in Business, presented by New Hampshire Business Review and Laconia Savings Bank, salutes the winners of the 2008 Outstanding Women in Business Awards, celebrating the success and achievements of women in our state’s business community. We have profiled six women who have truly excelled, not only in their professional lives, but as leaders and role models. While they come from different industries and walks of life, they share several things in common – extraordinary accomplishments, a strong sense of self and a belief that anything is possible. Their commitment and vision make them true leaders in their chosen fields. Beth Roberts can attest to the fact that working one’s way up from the mailroom to the corner office is not just a plot out of a Hollywood movie. For her, it really happened. Fresh out of high school, Roberts started her career in health insurance in the mailroom of Prudential. From there, she climbed the corporate ladder at Matthew Thornton Health Plan, before becoming regional vice president at Harvard Pilgrim, where she has worked since 2003. While Roberts has climbed quickly, she has not climbed carelessly. She has often put the company ahead of her own career goals if it’s better for the organization. She also has put others ahead of herself in the community, working with such nonprofit organizations as the American Heart Association, Greater Heritage United Way, the New Hampshire Children’s Museum and many others. While many of us would believe that a segue from mail room to the board room is due to luck, Roberts has proven that hard work, experience and heart are what it takes to open pathways. Q. What did you find to be the biggest challenge as a woman on the road to achieving your success? A. I don’t think gender really plays into my experience. I’ve been very fortunate. I’ve never had to sit back and had to do something differently because I’m a woman. Q. Have you found a difference in how women are accepted as successful in their chosen careers as compared to their male counterparts? A. Actually, I have never felt that. I’ve been blessed to work for very good companies. It’s important for me to define my own success. As long as I feel I have contributed something, I feel I’ve succeeded. Q. What was your biggest mistake and what did you learn from it? A. It’s easy to get misguided on which is the appropriate path to success. Keep your motivations true to what you want to succeed in within your career — if it is advantageous for the company, or yourself only. We all have an obligation to be good stewards of our companies. Q. Who has been most instrumental in your success and why? A. Very early in my career I worked for Terry Gauthier at Prudential. I was fresh out of high school, and she saw a potential in me that I didn’t know I had. She was harder on me than any one else. She was very instrumental and inspirational to my career. Everett Page, the CEO of Matthew Thornton, has also been important to me. He asked me what I wanted to do in my career. I said something simple, but he meant long term. Did I want to be CEO or COO? I hadn’t really thought about that at the time. He told me to take a lateral move, even if it meant losing some seniority, to gain greater exposure outside of my department. If I hadn’t taken that lateral move, I would never be in the position I am today. In the mid-1980s, Deborah Osgood took the reins of one of the most prestigious – but financially troubled – high-tech companies of the day after its owner died. As head of Snell Acoustics, Osgood tapped into a myriad of public resources and grants, putting the company on an impressive growth track. She believed other businesses could benefit from all the research she did. But what a business owner might call a research grant, a state agency might call “economic development.” How do you get the two sides to speak a common language? The answer came in the form of The Knowledge Institute and BuzGate, the Business Utility Zone Gateway. Launched by Osgood and her husband Bill, BuzGate is a free, Web-based directory that is as easy to use as it is vast in resources. But Osgood has gone well beyond just developing database directories for business owners. She volunteers her time with many organizations, including the New Hampshire Jobs for America’s Graduates, Big Brothers Big Sisters, SCORE and the Women’s Business Center. In her latest endeavor, she is working as a mentor for Iraqi women learning how to run a business. A. There were some male executives I dealt with around the world that couldn’t shake my hand. Another struggle was not just a woman’s issue, but trying to convince everyone that the BuzGate model was really a good thing to do. We had to work to get everyone to play well together. A. I’m afraid so, even today. You really do have to do twice as much to be taken seriously. A positive development is the growth rate of women entrepreneurs. It is twice that of other industries. In the traditional corporate environment, there is still the glass ceiling. Becoming an entrepreneur has fewer barriers to success. A. It was not believing in myself early enough. When you have good ideas and the ability to carry them out, but not the confidence, it really is a tragedy. A. Working with Bill early on as colleagues, then as husband and wife, and now co-owner, he has been the most significant asset, supporter and model. Anne Cruess was 25 years old when she set out to pursue a career as a landscape architect after reading the words of famed gardening expert Thalassa Cruso. 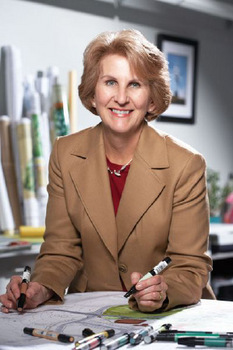 “I had never even heard the term ‘landscape architect.’ I never even knew the profession existed,” said Cruess, now senior vice president, chief landscape architect and principal of the award-winning Bedford-based land planning firm TFMoran Inc.
Cruess oversees the company’s landscape architecture services as well as its land-planning and graphics divisions. Cruess’ contributions to the beautification of communities throughout New Hampshire include Manchester’s Kalivas and Bass Island parks, the Heritage Rail Trail in Nashua and, most recently, the French-Atwood Marketplace on Route 101 in Bedford, which earned TFMoran the 2006 Plan NH Merit Award for excellence in planning, design and development. TFMoran has been in existence since 1968, and it was purchased by Cruess and her husband Robert in 1991. Since that time, it has been successful in building a reputation for its integrity and commitment to quality. The Bedford-based company provides civil engineering, surveying, soil and wetlands science, land planning and landscape architect services to commercial, residential, institutional and municipal customers throughout the Granite State. TFMoran has four offices in New Hampshire and has 65 employs. Cruess’ commitment to the land-planning industry and the communities her company serves goes beyond her role with TFMoran. The Amherst resident chairs the newly formed New Hampshire Board of Landscape Architecture and is active in the New Hampshire Joint Board of Licensure and Certification as well as an officer of the organization Granite State Landscape Architects. She also has a deep commitment to the arts, including her active support of the Granite State Opera and the Currier Museum of Art, for which she serves on the advisory committee. She also is an artist herself, having recently won a sculpture commission by Overnight Art!, a public art program funded through the New Hampshire Council on the Arts. A. Most design firms and their clients are male-dominated. Sometimes that works in a woman’s favor, but initially, against. A. It has been my experience that once a woman proves her competence then she’s on equal footing with a man. A. I wouldn’t exactly call it a mistake, but I misjudged the amount of time and energy it takes to raise a child and how that competes with effectiveness at work. A. My husband. Robert helped mentor me in business, encouraged my professional growth and supported my decision to spend more time being a mother. Cheryl Abbott admits she has never been much of an athlete. Today, however, as senior vice president of the Manchester Monarchs and a mother of two active children, she is surrounded by organized sports and loves it. Add to these two roles Abbott’s commitment to school and community organizations, and it’s easy to see that, while her sports skills may not compare to those of the Queen City’s favorite hockey team, her dedication and stamina are a source of inspiration. Abbott joined the Manchester Monarchs as director of community relations in 2003 and was named vice president of public affairs soon after. By the summer of 2007, she earned the title of senior vice president and now supervises the front office, the game presentation department, public relations, the merchandising department, marketing and graphic design. In addition to her corporate responsibilities, Abbott also oversees “Monarchs Care,” the team’s charitable arm, which has raised more than $1.2 million for local charities, including Toys for Tots, the New Hampshire Food Bank, the United Way and the Special Olympics. Abbott’s civic involvement doesn’t stop there. The former “40 Under 40” winner dedicates time to the annual Greater Manchester Chamber of Commerce Citizen of the Year Dinner and recently became a member of the Greater Manchester Boys and Girls Club board of directors. A resident of Weare and mother to Cameron, 14, and Courtney, 12, Abbott also remains active in the local schools and her children’s sports teams. A. Balance. I have so many roles, and they all intersect. I try not to let any one role consume me. I try to remain in a gray area, go with the flow and keep my priorities straight. A. Hockey and sports in general is not a traditional industry for women. But I really have not been affected. I embrace my personal brand and know who I am, and I think because of that and because of the work I do, I am respected. A. I’ve made some huge mistakes and some small mistakes, and I’ve watched others make mistakes too. I think it’s important to learn from them, reflect on them, but don’t dwell on them. A. My husband Mike has always encouraged me and has been a tremendous partner in raising our children. And my mom to this day offers guidance and continues to be a real self-esteem booster. On a professional level, my current boss, Jeff Eisenberg, has taught me so much in such a little amount of time. Christine Williams’s interest in the world of finance began at the knee of her Canadian uncle, a bank president who would take his young niece to work during her summer visits. Today, those memories serve as a cornerstone of a career that has included Williams’s own foray into the asset recovery side of the banking industry, a brief stint as general manager of New England Dragway and, for the last decade, an executive with the NHHEAF Network Organizations in Concord. Williams joined the New Hampshire Higher Education Assistance Foundation as director of claims and collections in 1996. Today she is vice president of guarantor services for the agency, responsible for the management of everything from educating families on the college loan process to booking loans, and overseeing claims and collections. The Bedford resident takes her downtime seriously. Each year Williams helps organize the annual Imperia Vodka Hair Style Competition in Manchester, a successful and popular fund-raiser for breast cancer awareness for the Elliot Breast Health Center in Manchester. Most recently, she spent a week helping medical personnel and construction crews in Honduras as part of her involvement with her local Rotary Club. She also has served as a mentor with the local Big Brothers Big Sisters program, and is a member of the fund-raising committee of the New Hampshire Jump$tart Coalition, which works to improve the financial literacy of teens. Passionate about travel, Williams has visited Thailand, Italy, Paris and Austria and hopes to see Greece, Africa and China soon. When closer to home, she enjoys snowshoeing, hiking and kayaking. Oh yes, and three years ago when she felt like getting just a little more adventurous, Williams talked half a dozen friends into joining her for a skydiving expedition. A. Being a woman has never been an issue. I’ve always found my bosses to be fair in their evaluation of my performance. As a matter of fact, when I got the call about this award I called my current and prior bosses and thanked them, because without them I never would have achieved this. A. I’ve found that as long as I’ve earned my success, my counterparts would respect what I achieved. Being a woman has never been a factor. A. At certain times in my professional career I lacked balance between work and my personal life. Today I can say I’ve achieved a well-rounded and balanced life and because of that, other opportunities have opened up and I’ve been able to excel across the board. A. I’ve had a number of professional and personal mentors and great role models in my current and former bosses. They’ve all been supportive, believed in community involvement and have helped me grow. A love of writing may have started Laurie Storey-Manseau on her career, but it was the desire to capture an even larger story that ultimately brought her to her current profession of public relations and marketing. Transitions from working a beat as a newspaper reporter to enabling her clients to beat the competition allowed her to partake of an even more fulfilling career. But more than achieving her own dream by opening her own firm in 2000, she has enabled her employees to achieve their dreams as well, providing a place to thrive and grow in their careers. Beyond her business, Storey-Manseau helps others make their wishes come true as a board member of Make-A-Wish Foundation of New Hampshire. She also supports the American Cancer Society, Concord Hospital, Pastoral Counseling Services and the Boys and Girls Clubs of New Hampshire, just to name a few. A. Being listened to. I like to say my piece. A lot of men get threatened. I don’t hold it against them. In our society, we’ve created an environment where the challengers get to be men, and that’s appreciated, even expected in men, but not women. A. Today, it’s not as bad as it used to be. There have been many women leaders of companies here and around world – they blazed a trail. They were facing a harder battle. I don’t face those challenges because they were there first. A. A real learning moment was thinking I can just go into a situation no-holds-barred and thinking everyone will accept it. It actually shuts people down. Now I realize I have a real obligation to listen to others. If you understand their perspective, you can work to bring the two together. A. Early on in my formative years in Syracuse, there was a woman named Darlene. She was a single woman in the 1970s. She was in her 40s, she worked in bank, and had no desire to get married. She was independent, outspoken, kind and generous. She was a real role model. Even though she passed away of cancer when I was 21, I still think about her a lot. Another mentor of mine said, “It’s not how many hours you work, but what you do in those hours.” I really learned from that. It’s how you manage your time.